It was concealed on metro shelving between a mound of recipe binders camouflaged in a thin veil of flour, clipboards clamped with stacks of checklists, inventories and ordering forms, plus all of Carlo Middione’s published cookbooks. Just to the right was a two-way mirror on the other side of which stood Carlo, invisible and watchful. “Mark speaking,” was how I answered. Carlo barely knew me then, and vice versa. The recipe was a torte, of sorts, of fried pasta and cooked spinach, plumped currants and toasted pine nuts; a gilded crispy-on-the-surface “pie,” but unctuously soft in the center. Although I was an accomplished cook, I had much still to learn about taste and relevance. Carlo’s Vivande Ristorante kitchen at his Opera Plaza location was where I met him and started working for him. Concealed behind the two-way mirror was Carlo’s office, which was a charming mess of books stacked high, for the bookshelves were full. And an oversized rolling pin: Anyone who knows Carlo also knows of his quirky fondness for humongous whisks and giant wooden spoons and such. I know him well and also know how he loved the story of Lilliput and I believe there is a link between the two: giant tools and miniature people. And in the corner, strangely, stood a cello with one sadly snapped frayed string. The cook would hang up and meekly wring his hands under the handsink faucet. I left the office perplexed and ate the delicious Pasta Fritatta alone on a giant butcher block in the kitchen. About a week later it was still bugging me. At the end of my shift, I knocked on Carlo’s office door and entered — and he said what would later be a familiar greeting: “Sit down. Take a load off.” I sat on a disused dining room chair and asked why he had asked me to make that recipe. He dug into a stack of papers and fished out a newspaper clipping of a book review of his La Vera Cucina and handed it to me to read. The reviewer, though singing mostly praises for the book, stated with impunity that the recipe for Frittata di Pasta con Spinaci “didn’t work.” Carlo had simply wanted to check to make sure his recipe was not incorrectly written and to prove, just to himself, that the reviewer was wrong. That was the beginning of my 11-year stint as Carlo’s right hand man — a position that changed nearly everything about who I was and made me into the chef I am today. I had a good grasp on technique then and was a dazzling line cook. I could sauté, flipping high into the air and catching the ingredients low for dramatic effect. But I still didn’t understand the difference between a thick and easy-to-work-with pie crust and a delicate, difficult one. Or between a firm dough that was easy to knead and one that was almost too wet to handle, but would produce bread with better texture and giant bubbles inside. It was these nuances that made Carlo’s food a cut above the rest; everything else was merely restaurant food. The fettucine we made at 2125 Fillmore at Vivande Porta Via was mixed in a giant five-foot mixer, and the mixer itself had the interesting pedigree of a past life bolted to a ship’s floor. Who knew all the places that mixer had sailed before being installed on the tiled floor of Vivande? And the elegant giant pasta machine with its huge rollers rendered pasta sheets so thin you could see your hand through them. The pasta when cooked was of such a transcendental texture, resilient, with a slight springy bounce on the plate, but easily coaxed into a twirl on the tines of a fork, endearingly embraced by just the right amount of sauce. Vivande Porta Via was located at 2125 Fillmore Street for 29 years. I still see Vivande regulars almost every day, all of us wandering as if homeless, all of us waxing and waning with our memories and perpetual longing for Vivande’s incredible pasta dishes. Take the “creamless” carbonara; Carlo taught us that adding cream was not only a bastardization of carbonara but also completely unnecessary. Equally innocent of cream and misunderstood by the rest of the world was Carlo’s vodka sauce — his being fresh, light and jazzy, with a top-note of coarsely ground black pepper. I love to re-create his reverse-polarity puttanesca, in which he showcases its true pantry ancestry, his version being more an earthy, sultry, deeply nuanced tapenade studded with fresh tomato concassé, singed with red pepper flakes. Remember the delicately fried oysters? And his playful Fusilli alla Carlo, which he would always stress was a departure from his devotion to his classical regional Italian hard line, yet fit right in with his repertoire. And most of us still remember fondly being served a fantastic Montepulciano d’Abruzzo or velvety Valpolicella in tumbler glassware — what his wife and business partner Lisa Middione would term “taking wine off its pedestal.” In later years, Vivande would bow to outside judgment, adopting the use of stemware. We miss the hazelnut meringue cake adapted from the actual dacquoise served at Queen Elizabeth II’s 1953 coronation. We long for the silky-smooth lemon curd tart, for which I still hold the secret ingredient very close to my chest. And let’s not forget the hilariously christened Earthquake cake. To cap it all off would be a deceptively short shot of the mime-like smiling Santos’ espresso. V ivande Porta Via was an enchanting and wildly original place; the word “restaurant” could hardly be used to describe it — a true gastronomia, the only of its kind, certainly. 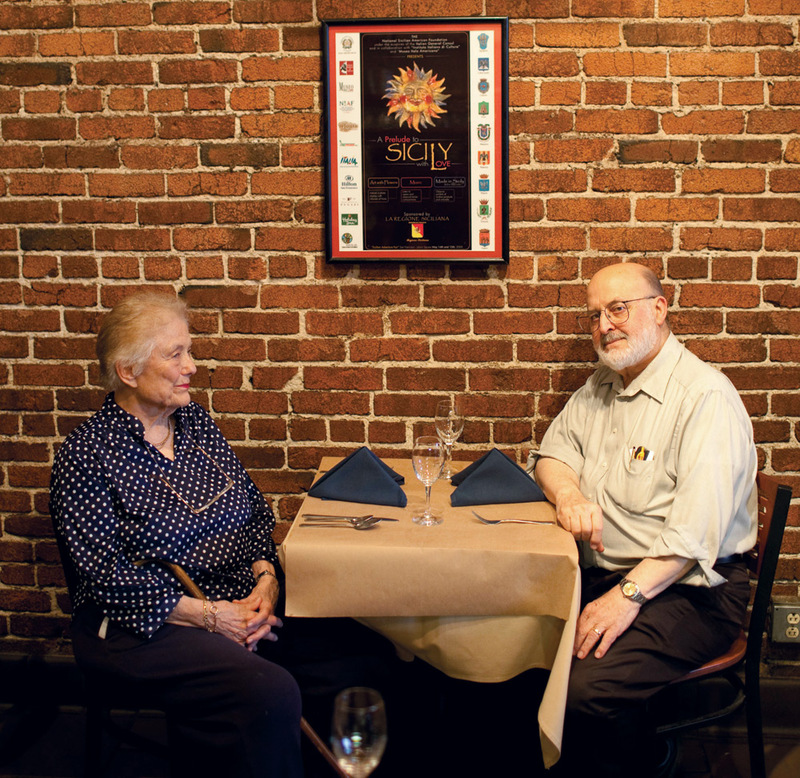 Carlo Middione could have opened a restaurant in that long, narrow space on Fillmore, but he chose the harder task of creating a piece of Europe seldom experienced in this country. A huge part of the draw was the three beautifully filled sparkling glass cases brimming with house-made sausages — the recipe from Carlo’s grandfather in the town of Agrigento in Sicily — pâtés, condimenti and contorni, not only dishes but phrases Carlo taught us to adopt into our way of lives. 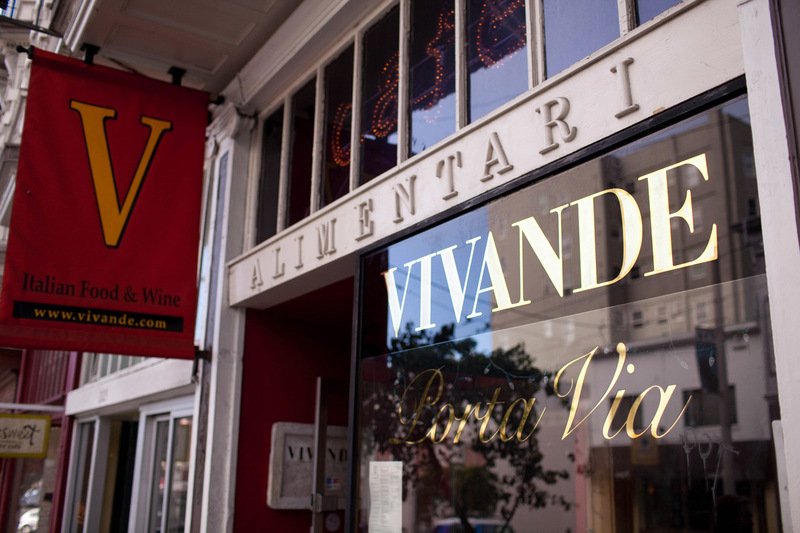 Vivande taught us to eat better, and demonstrated to us the endless array of regional Italian recipes. I belong to a small group of food lovers who gather once or twice a week over glasses of wine. One day recently the topic, unaided by me, strayed to eggplant, and I let loose with a description of Vivande’s eggplant sandwiches. I held my court of food fanciers spellbound when I told them of thinly sliced mortadella and provolone sandwiched between two slices of eggplant, the whole thing breaded in a mixture of equal parts bread crumbs and grated Pecorino Romano cheese, sparkled with chopped parsley, anointed with extra virgin olive oil and baked until golden brown on both sides. Also in the Vivande glass cases near the front door was the magical and hypnotic capunatina, that too made with eggplant. A beautiful girl once fell in love with me, albeit temporarily, almost completely because I made her a huge jar of capunatina to keep in her refrigerator. The jar didn’t last long and she still periodically asks me for a refill. Every springtime without fail I make a big batch, for I never learned to make a small batch of Carlo’s capunatina. And though I know it completely by heart, I always fold his Food of Southern Italy cookbook open to page 218 and revisit his enchanting paragraphs on the subject, which take you on a journey to its Saracen roots and yet describe the true present-day versatility of the dish. Also we miss the hand-pies, scrumptiously filled with either steamed chicken or mushrooms, tender and flaky. The small roasted chickens that I recall preparing every morning. In the cold winter months after I had them fastened and twirling on their spits, Carlo and I would take a mid-morning coffee break standing near the custom built spit-roaster, warming our hands and dipping crusty bread in the delicious drippings — a weakness of which I never was cured. Carlo indulged me. He and Lisa once described a chilled aspic “refresher” they enjoyed at the intermission of a symphony held in the height of summer in Vienna. I was given free reign to replicate it. Of my own volition, mostly to surprise them when we had a heat wave, I came to their table with wobbly cubes of deliciously rich aspic in a chilled bowl. Many years later I made them, privately for dinner, soft boiled duck egg suspended in aspic with bits of prosciutto and herbs based on another conversation from years earlier. Carlo had a way of speaking that was mesmerizing, invigorating and inspiring. It made you want to leap into his story and taste the things he was reminiscing about. Another time he told me of an elegant and tiny folded pasta called cappellacci, which he described so intoxicatingly that I insisted we include it on a menu for an upcoming big function. The next thing I remember was handmaking 500-plus of them. It was a cripplingly daunting task, but it was a choice. Carlo taught me how important and noble it is to entangle nostalgia into a recipe, to translate time and place with a dish; otherwise, it’s just eating. Carlo taught me not only how to cook, but also why we eat and how to eat. That’s an important distinction. One of my fondest memories, among so very many, is tinged in sadness. The Middiones’ opus project Vivande Ristorante was closed down. There are so many reasons this happened, but none of them was for any failings of the food or the ravishing decor. The Middiones lost their home along with the restaurant, and I was asked to come over and help Carlo box up his library. It was a small room with pleasant natural light. His desk was small, and on it was the word processor he’d used in writing La Vera Cucina. From floor to ceiling the walls were covered in bookshelves of rare cookbooks: the entire Waverley Root collection, Elizabeth David, M.F.K. Fisher, Richard Olney, obscure books only in Italian, and ones I’d never heard about but immediately loved. We were meant to take all these books off the shelves and store them in moving boxes, labeled so Carlo would be able to find one in case he needed it in the meantime. But Carlo and I had a history of being completely unproductive at tasks like these. I would pull a single volume off the shelf and exclaim, “Wow!” — and he would drop everything and rush over and fold it open to a page that would make my culinary jaw drop even lower. We’d sit on little stools talking endlessly about recipes and dishes and my head would get jam-packed with ideas, the boxes filling at a snail’s pace. I assembled an antipasto from the Middione’s pantry and refrigerator: cubes of aged Pecorino studded with black peppercorns, slices of hung salami, oil-cured black olives, homemade pickled eggplant spiked with red pepper flakes and wild oregano. Carlo emerged from his wine cellar with a dusty bottle of eight-year-old Barolo, a wine way too mature and fine to go with my meager antipasto. But I think he dug it out as a gift to me, which was something he often did. We dined on this midnight supper and then called it a night. The next afternoon I was back in his library to do it all over again. 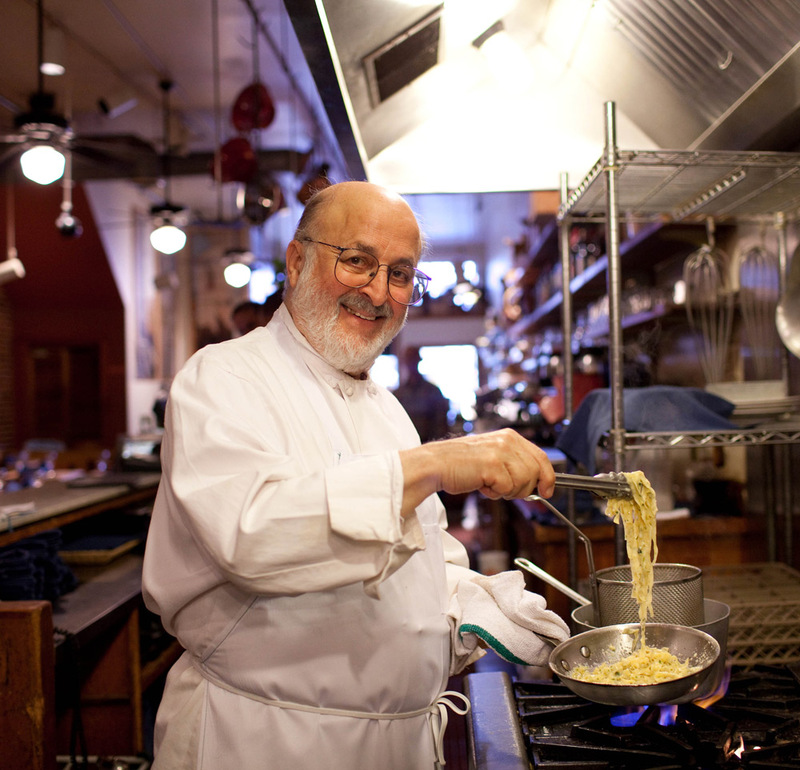 There are just too many stories to tell about Carlo’s generosity of wisdom and how he used food, the eating of it, and the knowledge of it, as gifts to us all. I remember a scare we had when one of our regular customers had to have heart surgery. Paul was beloved to all of us, and he recovered from the surgery beautifully. But the first thing Carlo did was make him a big batch of his lovingly named Lilliputian meatball soup. We made a rich broth, skimmed and strained and crystal clear, which we embedded with the tiniest veal meatballs you’ve ever seen. Again, that fantasy about Lilliput. A standard soup spoon could easily hold 12 of them. Delicately seasoned for the infirm, Carlo explained it is what his mother would make when people were not feeling well. Years later, Carlo was in the operating room himself and I went to work early and made that soup for him. My 11 years working beside Carlo Middione at Vivande remain the very best years of my life. I mourn them constantly, but the heritage of the recipes and the style Carlo taught belong to me now. His gift. One day I hope to open a Vivande of my own under my own name, if the culinary gods allow it and the public wants it again. 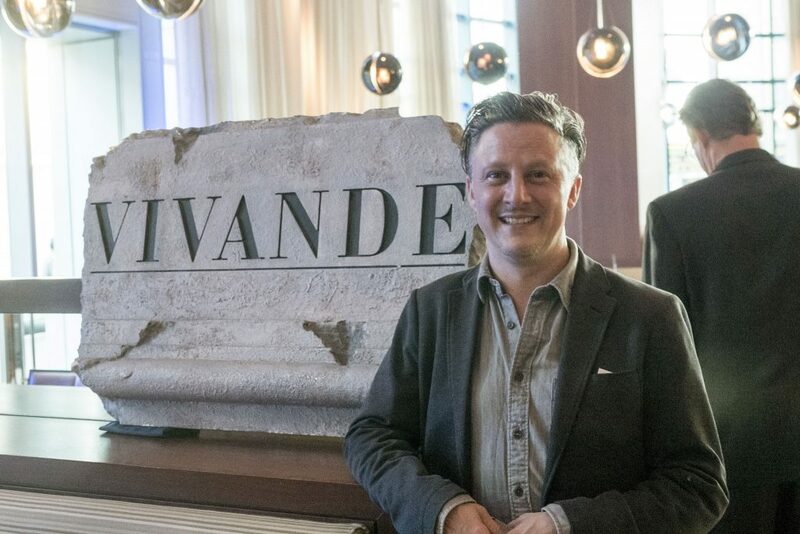 Mark Fantino at the April 16, 2015, dinner celebrating Vivande and its owners.